Flipping through an old high school yearbook can be a nostalgic trip down memory lane. "What ever happened to good old Joe? Wow! Has Brenda ever changed since that photo!" Historians can ask the same sort of questions as they flip through the pages of The New York Gazetteer, New York City's loyalist newspaper during the American Revolution. In the news stories, advertisements, and notices featured in the Gazetteer, one finds names of loyalists who would later become significant in Canada after 1783. For example, in the March 3, 1774 edition of Rivington's newspaper, there is a notice of a nineteen year-old blacksmith's apprentice named John Darow who ran away from his masters, Munson Jarvis and Benjamin Belding, in Stamford, Connecticut. On the surface, there is nothing unusual or noteworthy about the ad. Indentured servants from Europe and enslaved Africans ran away on a regular basis. However, it is one of Darow's masters who would become significant in New Brunswick. Munson Jarvis was just 32 when he placed his notice in Rivington's Gazette. He was the eldest son of a prominent family and had every reason to believe he would follow in the illustrious footsteps of his father, Samuel Jarvis. After marrying Mary Arnold in 1770, Munson became the father of four children: Mary, Ralph, William and Edward. A silversmith like Paul Revere, Jarvis was anything but a patriot; he was brought before the local revolutionary committee several times between 1775 and 1776. Finally, in the latter year, he was "condemned and advertised as inimical to the Liberty of America and an Obstinant Adherent to the Ministerial Cause". Sometime before October, Munson escaped to Long Island, N.Y where he recruited soldiers for the Prince of Wales' American Regiment before setting up business in New York City. Munson and his brother William (the future provincial secretary of Upper Canada), served with General Tryon when his troops marched on Danbury, Connecticut in April of 1777. At some point in the revolution, rebels imprisoned the two Jarvis brothers, but "by the assistance of friends who had privately procured some feminine clothes, they dressed themselves therein, and by that means made their escape through the Rebel army." Munson and his family joined the 1783 loyalist evacuation to the mouth of the St. John River. Ever the business man, Jarvis opened a hardware store shortly after arriving in Parrtown and eventually bought a brig to facilitate his ventures. Over the next three decades, his company developed trading relationships that reached across the ocean to England, the West Indies, and the United States, stretching into the interior of New Brunswick on the Saint John River system. His brother Samuel, who had remained in Stamford, was his major American partner, while William, who in 1792 accepted an appointment as secretary and registrar of Upper Canada, was his initial contact in England. The products that went through Jarvis' warehouse were whatever the market demanded, including slaves. On July 5, 1797 he sold an African man and woman to a local loyalist. In 1785, Munson Jarvis became a member of the first council of the newly incorporated city of Saint John. He would sit on the common council from May 18, 1785 until April 20, 1790. Munson was a claimant at the loyalist compensation hearings when they convened in Saint John in October of 1787. He hoped to be redressed for £600 in losses. "The old proverb says half a loaf is better than no bread," he wrote ruefully to his brother William when consideration of his claim was delayed, "but in the present case if we could get a quarter we might think ourselves well off." Eventually he was awarded £250 by the loyalist claims commission less than half of what he sought. Munson was nevertheless not one for regrets or going back. Some loyalists had returned to their former homes, but for Jarvis "generally speaking those that have gone back were a set of poor wretches . . . Very few people of any consequence have left us." He continued to regard the revolution "as one of the blackest scenes of iniquity that ever was transacted. We have fought a good fight (temporal), if we have not overcome the thirteen United States, yet we overcome one of the great (I won't say good) allies, the devil and all his works." In 1789, Munson lost an election to represent Saint John in the colony's House of Assembly. Two years later, he became a vestryman (a member of the congregation's governing body) at the city's Trinity Anglican Church. In 1798, two of Munson's children, Ralph and Mary, visited their patriot relatives in Stamford, Connecticut -- demonstrating that family ties were still strong despite political differences within the Jarvis clan. In 1801, Munson established North America's first fire insurance company. Three years later, at 62 years of age, he won a by-election and represented Saint John in the House of Assembly. He would serve his constituents for five years and then retire from politics. Munson Jarvis died in Saint John on October 7, 1825, just days short of his eighty-third birthday. At his death, he owned a brick house on Prince William Street and a store on the south side of Market Slip. All of Munson's living siblings, received "£10 for mourning". He was in business with his son William (1787-1865) at the time of his death. William would one day become the chief justice of Prince Edward Island, while Ralph and Edward were hardware merchants. We began our look at the life of Munson Jarvis with a reference to him in a 1774 newspaper notice. The last place where the public could read his name would be on his tombstone in the old burial ground of Saint John. However, sometime between 1880 and 1908, Jarvis' grave lost its marker, so the exact location of his remains is unknown today. Next week's Loyalist Trails will take a second look at some of the loyalists named in The New York Gazetteer. James Rivington (1724 -- July 1802) was an English-born American journalist who published a loyalist newspaper in the American colonies called Rivington's Gazette. Some scholars in the 1950s determined that despite all outward appearances, Rivington was a member of the American Culper Spy Ring. Rivington was one of the sons of the bookseller and publisher Charles Rivington and inherited a share of his father's business, which he lost at the Newmarket races. In 1760 he sailed to North America and resumed his occupation in Philadelphia and in the next year opened a print-shop at the foot of Wall Street, New York. In 1773 he began to publish a newspaper "at his ever open and uninfluenced press, Hanover Square". The first of a number of newspapers, The New York Gazetteer or the Connecticut, New Jersey, Hudson's River, and Quebec Weekly Advertiser was issued in April 1773. His initially impartial stance shifted as a revolution loomed and public opinion polarized, until by late 1774 he was advocating the restrictive measures of the British government with such great zeal and attacking the patriots so severely, that in 1775 the Whigs of Newport, Rhode Island, resolved to hold no further communication with him. The Sons of Liberty hanged Rivington in effigy, and the patriot poet Philip Freneau published a mock speech of Rivington's supposed contrition at his execution, which Rivington reprinted. He infuriated Captain Isaac Sears, the prominent patriot and Son of Liberty. The story behind the most famous betrayal in U.S. history shows the complicated politics of the nation's earliest days. He was short, solidly built (one acquaintance remembered that "there wasn't any wasted timber in him") and blessed with almost superhuman energy and endurance. He was handsome and charismatic, with black hair, gray eyes and an aquiline nose, and he carried himself with the lissome elegance of a natural athlete. A neighbor from Connecticut remembered that Benedict Arnold was "the most accomplished and graceful skater" he had ever seen. The American Revolution as it actually unfolded was so troubling and strange that once the struggle was over, a generation did its best to remove all traces of the truth. Although it later became convenient to portray Arnold as a conniving Satan from the start, the truth is more complex and, ultimately, more disturbing. Without the discovery of his treason in the fall of 1780, the American people might never have been forced to realize that the real threat to their liberties came not from without, but from within. In the tortuous months ahead, Arnold would survive his oft-delayed court-martial with a reprimand, and Washington would restore him to command. But the emissary's visit was the first tentative step that led, in late summer-fall of 1780, to Arnold's doomed effort to hand over the fortifications at West Point to the enemy. Following the British Army's successful occupation of New York City in 1776, the second year of the American Revolutionary War, the areas surrounding the city that were between the American and British lines became a no man's land. These areas, which included Westchester County, New York and Greenwich, Connecticut, were frequently the site of raiding actions between the combatants. At the end of 1779 this no man's land included Tarrytown and White Plains. The American lines were not far north of this area, extending into Mount Pleasant. An outpost at Four Corners (in the present-day Thornwood section of Mount Pleasant) occupied particularly advantageous ground, and its occupation was more than once disputed. The outpost was on the property of Joseph Young, a local landowner; his house and barns were occupied by Continental Army troops beginning in August 1776. In December 1778 a British raid captured the small garrison posted there. They burned a barn but did not occupy the post, and it was promptly reoccupied by Continental Army troops in early 1779. On the 1st of September 1775, the War Office of Great Britain issued an order to regimental and general surgeons stating that no amputations or other intricate operations were to be performed without first consulting the Physicians and Surgeons of the General Hospital. Issued to surgeons in the British Military during the American Rebellion, one would think that surgeries might be crucially important to ensuring the survival of soldiers wounded in combat, so it begs wonder why they would be prohibited from performing potentially life-saving actions. The hierarchical nature of medical practice in Britain carried over to the military, resulting in prejudicial orders such as the one examined here. The hierarchical structure of licensed practitioners in early modern England and the competition and animosity between these "regulars" (licensed, educated practitioners) and the "irregulars" (untrained practitioners) created a great deal of tension. The military medical services were arranged very similarly to medical practice in Britain and divided into the general and regimental hospitals. All decisions in the medical services were controlled from the top. Benjamin Franklin made two missions to London prior to the Revolution; the first from 1757 to 1762, the second from 1764 to 1775. In the final four months of his second mission he became involved in three efforts to secure a peaceful solution to the constitutional divergence that was growing between England and her American colonies. Because the efforts involved many of the same people, overlapped in time, and involved back-channel meetings, their stories need to be told simultaneously. Hidden in the Nineteenth Century histories of Georgia is a likely answer to a question that has puzzled students of the American Revolution in the South for decades; why was General Andrew Williamson, acting in the same manner as so many around him, singled out as a traitor, loathed by so many as the "Arnold of the South." From 1816 until 1883, the telling of the history of Georgia was largely dominated by three men, their work considered the benchmark by which other Georgia histories are compared. As the thinking goes among those who know about these things, Hugh McCall was the first of these three earliest historians, and while fondly remembered is today considered the most flawed. William Bacon Stevens followed McCall, and with better source materials, has come to be viewed as a better historian than McCall. Charles C. Jones, Jr., writing last, is considered by many as the best of the nineteenth century Georgia historians. This is a proposition which, in my opinion, is flawed and does not always work well. Sometimes it takes all three, plus other non-Georgian historians, to get close to what must have been the real story. Each wrote about a small, seemingly insignificant event that is, to me, an epiphany; a revelation into why the American Southern Strategy, following the Fall of Charleston, almost failed because of one man. On the night of July 11, 1780, a group of desperate men crossed the Savannah River, escaping that part of Georgia left them like a bread crumb by the British. They were attempting to link up with rebel militia on the Carolina side. McCall wrote that this was the militia command -- what remained of it---of Col. Elijah Clarke and that the crossing had been planned, "Agreeably to appointment ..."
Thomas S. Kidd, a Professor of History at Baylor University and author of Benjamin Franklin: The Religious Life of a Founding Father, leads us on a detailed exploration of the religious life of Benjamin Franklin. As we conduct our investigation, Thomas reveals details about deism and whether Benjamin Franklin was a deist; The impact Franklin's upbringing in a devout Puritan household had on his life and ideas about faith and religion; And, information about how Franklin continually grappled with ideas about virtue, morality, and theology. Colonial North America at Harvard Library provides access to remarkable and wide-ranging materials digitized as part of an ongoing, multi-year project. When complete, the project will make available to the world approximately 470,000 digitized pages of all known archival and manuscript materials in the Harvard Library that relate to 17th- and 18th-century North America. At present, there are nearly 300,000 digitized pages available through this website and updates are made periodically. The items linked to the map below illustrate the nature of the materials in the collection. Not only documenting life in New England, the collection also extends well beyond those boundaries to Canada, and beyond. Where are Jo Ann Tuskin of Gov. Simcoe Branch and Carol Childs & Jim Stewart of London Branch? On Thursday, January 25, 2018, the American Revolution Round Table: Hudson/Mohawk Valleys proudly presents, "Industrious Sober Women: Soldier's Wives in Burgoyne's Army" by Jenna Schnitzer. The program will be held at the Saratoga Town Hall, Schuylerville, NY. The event starts at 6:30 PM with time for socializing, program at 7:00 PM. The talk is an overview of the roles of soldier's wives during the Burgoyne Campaign. It will explore some of the myths and perceptions we have about these women. Schnitzer will be using primary sources and period images to illustrate their roles and what they may have looked like - see photo. RSVP to arrthudsonmohawkvalleys@gmail.com or call 518-774-5669. Anne Redish Presents: "Loyalist Period Clothing", details at Sir Guy Carleton Branch. RSVP by March 1, 2018 to attend, CarletonUEL@hotmail.com. March 10, 2018, 1:30 - 4:30pm, City of Ottawa Archives. Become immersed in the fiction, facts and feel of clothing of the time of the Loyalists (late 1700s -- early 1800s). Using clothing as a gateway, we can learn about the day to day details of their lives. Clothing can tell us about the people, their heritage, their work, and give us information about their crops and industry. If we choose to do our best to dress as they would have, it may help us to imagine what it would be like as a 'Loyalist immigrant or refugee' to be in their 'shoes', or petticoat, or cap! Bring or wear your Loyalist attire to contribute to the discussion! If it no longer fits or if you do not intend to use it again, that's OK. Anne will discuss how it might be improved or altered, starting with how she wishes to improve her own. And bring your camera to take close-up images of the items and resources you will see! Anne Redish is a United Empire Loyalist of many ancestors initially from the Kingston and Bay of Quinte area. A subsequent hands-on workshop is being planned. On his way to a Robbie Burns Dinner, Brian McConnell says hello from the post office in Barton, Digby County, Nova Scotia. Barton was named after Lt.- Col. Joseph Barton, commander of the 1st Bttn. New Jersey Volunteers. 19 Jan 1770 Riot known as the Battle of Golden Hill erupts when British post handbills attacking Sons of Liberty. 18 Jan 1777 Congress orders signed copies of Declaration of Independence sent to the States. 17 January 1706 Benjamin Franklin was born on on Milk Street, in Boston, Massachusetts, and baptized at Old South Meeting House. His father, Josiah Franklin, a native of England, was a candle and soap maker who married twice and had 17 children. 17 Jan 1777 Patriot forces begin moving on a British post at Ft. Independence, King's Bridge. 17 Jan 1781 Americans rout British at Cowpens, undermining idea that they could not defeat British in open battle. 16 Jan 1776 Loyalists in British-occupied Boston tear down Patriots' old North Meeting House to use for firewood. 15 Jan 1777 Vermont declares independence from Britain--and New-York, remaining an independent Republic to 1791. 14 Jan 1784 Congress ratifies Treaty of Paris, officially ending over 8 yrs of Revolution. Townsends: Rabbit Over an Open Fire! Whoa Nellie! Local history student discovers family tie. Students in Owen Sound ON research their family history. Surprise: at least one Loyalist family discovered. A Newly Discovered Painting of Gen. George Washington's Headquarters Tent, 1782. While the actual tent still exists, as well as numerous descriptions of it dating from the Revolution, there wasn't an 18thc image that showed it in use in the field. 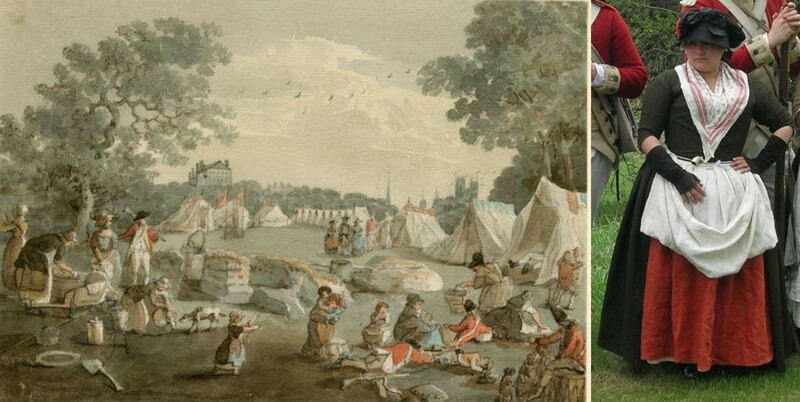 However, in one of those fortuitous discoveries that make history so special (and delights viewers of Antiques Road Show), an 18thc watercolor showing the tent suddenly appeared at auction last spring, only weeks after the MoAR had opened. While the auction house had labeled it as simply a "Revolutionary War Camp Scene," to Dr. Philip Mead, Chief Historian and Director of Curatorial Affairs for the Museum, recognized the tent as once. Fortunately, no other potential buyers did as well, and the Museum was able to acquire the drawing for its permanent collection. With a heart full of love and gratitude I now take leave of you": George Washington's Farewell Toast. On December 4, 1783, an emotional George Washington, commander in chief of the Continental army, stood before his officers in the Long Room of Fraunces Tavern in New York. The Revolutionary War had ended three months earlier, with the signing of the Treaty of Paris, and the United States was an independent nation. On November 25, the remaining British troops had evacuated the last occupied city---New York. At the tavern, fighting back emotions, Washington broke the heavy silence with the raise of his wine glass. "With a heart full of love and gratitude I now take leave of you," Washington toasted, as his eyes scanned the room. "I most devoutly wish that your latter days may be as prosperous and happy as your former ones have been glorious and honorable. I cannot come to each of you but shall feel obliged if each of you will come and take me by the hand." And with that, the General stepped back and waited for his men to approach him. Read about the 2017 re-enactment. Washington's Quill. Died 20 Jan 1767 �tienne de Silhouette, the man whose name is associated with silhouettes. First silhouette shown is of Jane Austen. Read more about this fascinating topic - Silhouettes and �tienne de Silhouette. Colonel John Butler (Niagara) Branch UELAC sadly announces the passing of long time member Barbara Burwell, UE, in her 83rd year. Barbara passed away suddenly but peacefully at Toronto Western Hospital on Friday, January 12, 2018. Barb was the beloved daughter of the late John & Roberta (McEachran) Burwell and is survived by her loving sisters, Joan Shea (Tom deceased), Sally Burwell & Janet Bell (Ken); many nieces, nephews, great nieces & nephews, cousins & friends at Christie Gardens Retirement Home & Eglinton St. George's United Church, Toronto. Barb graduated from the University of Toronto with a B.Ed. & Honours Specialist, History. She was an excellent family historian and researcher, an advocate of "Cluster Family Research" many years before it was widely promoted & popular. Barb was always ready and willing to help others with their family research and was very proud of her Loyalist ancestors especially James and Samuel Burwell who served in the New Jersey Volunteers. We will miss her interesting letters with her latest research findings. Peacefully, on January 16, 2018 at Hamilton General Hospital in his 76th year. Beloved husband of Donna (nee Speare). Loving father of Leanne Fortman and her husband John, Brad and his wife Nicole. Wonderful Papa to Briar. Survived by his sister Mary McLeod (Walter), brother-in-law and sister-in-law Glynn and Jackie Speare. Predeceased by his parents Murray and Violet and brother Murray. He will also be sadly missed by many nieces, nephews and lifelong friends. Brian was a proud member of the John Butler Branch of the Empire Loyalists. Friends will be received at Donald V. Brown Funeral Home, 36 Lake Avenue Drive, Thursday, January 18, 2018 from 2-4 and 7-9 p.m. Funeral Service will be held in the Funeral Home Chapel on Friday, January 19, 2018 at 11 a.m. Interment to follow at Tapleytown Cemetery. In lieu of flowers, donations to the Cancer Assistance Program would be greatly appreciated. Notes of sympathy and condolence may be made at donaldvbrown.ca. Brian and his wife Donna have been faithful members of Col. John Butler (Niagara) Branch and attended most meetings since 2008 when Brian received certificates for his Loyalist ancestors Joseph Merritt and John Shaver. He will be truly missed. Peacefully entered into rest on Saturday, January 13, 2018 at the West Haldimand Hospital, Hagersville, in her 98th year. Beloved wife of the late John H. (Jack) Nelles. Loving mother to Margaret and Keith Crawley and Bill and Esther Nelles. Dear grandmother of John and Peter (Alix) Crawley and Krista, Jason (Courtney) and Ryan Nelles and great grandmother to Katelyn, Jack and Maxwell Crawley and Marie and Katherine Nelles. Sister of Helen Lishman and Ethel Rowntree and predeceased by her brother David McClung. Mary is also survived by her many nieces and nephews. Visitation took place in the Miller Funeral Chapel, Caledonia, on Wednesday, January 17, 2018. The service was held in the Grace United Church (Caledonia) on Thursday, January 18. A private family interment and committal service will take place in the Caledonia Cemetery prior to service. In lieu of flowers donation to the Grace United Church, Caledonia, or to the West Haldimand Hospital would be appreciated by the family. Mary was a long time member of the Grand River Branch. She was a great resource for the history along the Grand, in particular the Young and Nelles families. I recall her cheerful smile and look of delight as she shared he extensive archives of material. In the 26 Nov. 2017 issue of Loyalist Trails, Dawn Horstead asked if George Harper and Benjamin Babcock, both UEL descendants - were sentenced to death for stealing sheep. She , had not had success finding out when they were executed, or if their sentence was commuted. Guylaine Petrin responded. She referred me to work being done by Linda Corupe UE who has been "transcribing and publishing the Assizes Books of Upper Canada" for the last 10 years. According to Guylaine, her transcription of the period in which I am interested may be published this summer. Her website offers many publications of value to UEL researchers. She does not just have the court records, but she also has lots of extra documentation such as petition for mercy, newspapers accounts and much more in her appendix. She has published until 1829, and the next volume is due this summer I think. In those days, when someone was sentenced to death, it was habitual that a petition for mercy would be sent to the Lieutenant Governor, and he would decide whether to grant mercy or not based on the recommendation of the judge. Those files are great and they give lots of information about the case and the trials, which is why Linda often includes them in the appendix of her books. And the books are fully indexed too. Those petitions for mercy are often found in either the UC Sundries or in the State Submissions. In this case, it is quite likely that they were not executed, since you would have found records of that since executions were rare and well reported. So what you need is the report from the Lieut-Governor about the petition for mercy to find out what the real punishment was."